There aren’t many game genres older than the humble shoot ‘em up. A mainstay of video games since Space Invaders, it’s a genre that’s seen its fair share of classics like Super Parodius, Ikaruga and Gradius. 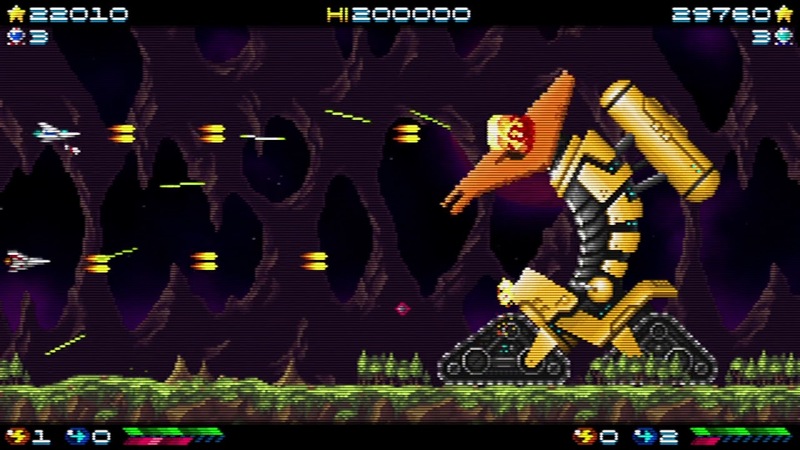 In more recent times it has become pretty niche, but there are developers looking to stir up memories of the old greats and here Locomalito is attempting to make fans don their rose-tinted glasses with their remixed and expanded version of their shoot ‘em up Super Hydorah. 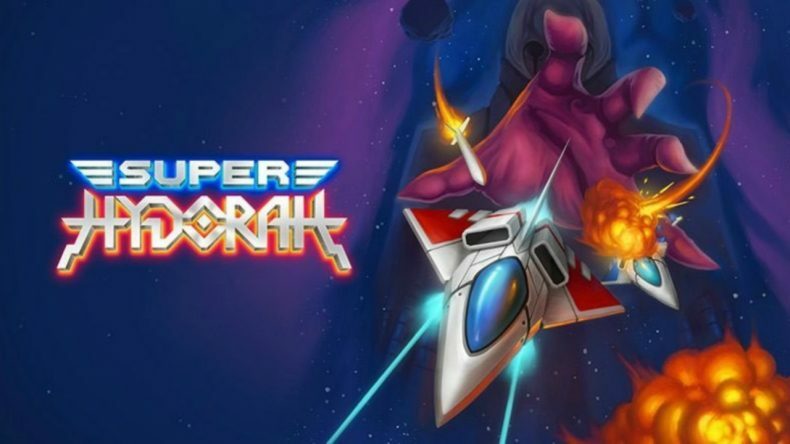 In what will feel familiar to many there has been an invasion by an alien menace called the Meroptians, and as one of humanity’s best pilots you must set out to eradicate the threat. You’ll fly from left to right through a series of levels blowing ships and creatures out of the sky, collecting power-ups and blasting things to smithereens – so far, so very shoot ‘em uppy. What’s different here is that there’s a rogue-like element whereby once you’ve lost all your lives you can either retire and keep your score intact, or you can forfeit your score and continue; a lifesaver for those who would rather finish the game than chase a big number. The action follows a non-linear path through the campaign by way of a series of forking paths not unlike the way Lylat Wars was structured. Some levels have one part, some have several, and each part is punctuated by a boss fight. Defeating the boss at the end of a level grants a new weapon type for you to experiment with, although be warned that if you don’t continue after death you lose access to those weapons as well. Aside from basic bullets you can get lasers, diagonal bullets, bombs and, my personal favourite, the Scorts. The Scorts are little additional ships that fly alongside you and fire off their own lasers as you fire yours, although they don’t take any damage which makes them incredibly handy. If you move your ship back or forward the Scorts swing between the front and back of the vessel, and if you time it right they can be used to absorb bullets closing in on you as well as to concentrate fire on a smaller target. The levels aren’t exactly lookers, but you won’t really notice that when you’re zipping around trying not to get hit. There’s also more going on than just things scuttling around and bullets flying all over the place; levels are full of other hazards like falling debris, asteroids, and plants that grow out of the walls. You can never really be sure what you’re going up against until you take on each level for the first time, so you’ll most likely play through a couple of times before you start aiming for the higher scores and those multiple endings. There’s not really a lot wrong with Super Hydorah. It’s a perfectly competent shooter and it lands all the basics, plus it’s pretty damn cheap. The thing is it doesn’t do much that sets it apart. You won’t find anything to match the thrill of Bug Princess or Ikaruga, but this is meant as a throwback to the 80s and in that regard it does its job well. 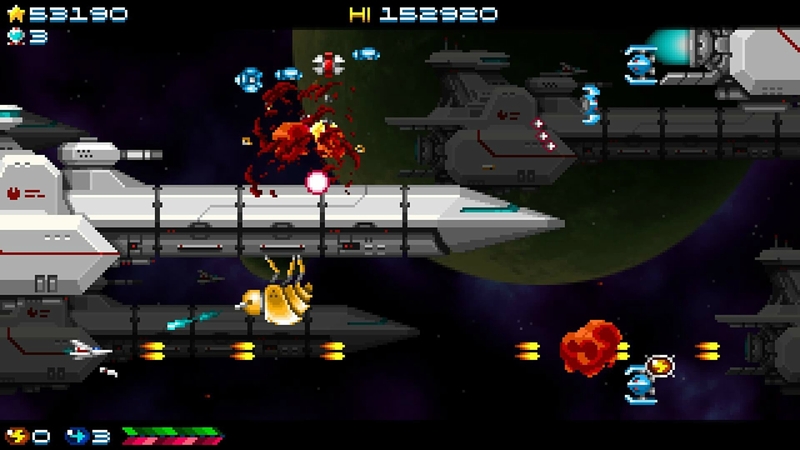 There’s a great sci-fi soundtrack from Gryzor87, a nifty little CRT effect, two player co-op (with Player 2 able to join a continued game) and a co-op mini game to boot, making Super Hydorah a rather decent package. Its no-frills approach means it’s easy to pick up and play even if it doesn’t add anything to the genre, but if you’re after a quick shoot ‘em up fix then Locomalito have you covered.